an embellished Valentine mini bottle. I had saved these bottles believe it or not from a probiotic yogurt I purchased at the health food store. I thought they were small and cute and I like to upcycle items as much as possible. I held on to them, so glad that I did. While looking for table features for a Valentine's Party photo shoot I was working on, I came across these adorable templates for heart shaped napkin rings from Piggy Bank Parties. You can download the free template here. I thought they were adorable, but like I usually do, I wanted to come up with a different way to display them. So I used the napkin rings and bottle bands. Here's how to get started. Once you download your free template (make sure you print it out on red paper) and cut out we are ready to get started! 20 strips of twine in the same length. I used a good craft glue and brushed the surface working one piece of twine at a time until all 20 pieces are laid out. Once I joined the two heart halves to "close" the napkin ring, I painted a glitter heart to make it pop a bit more! 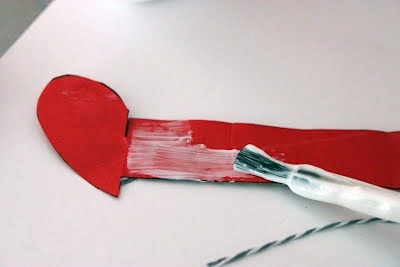 Valentine Party Table Scape. What do you think? I added a little more baker's twine to the top of the bottle just wrapping it around and tucking it under. Then just add a pretty striped paper straw and a little Valentine flag straw topper from The TomKat Studio and voila! 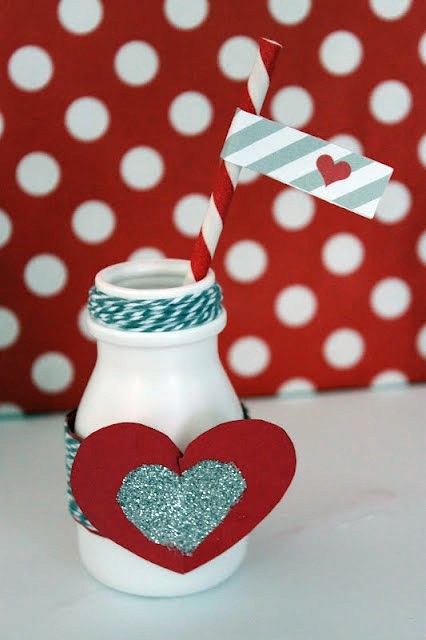 I hope that you enjoyed these Valentine's Party embellished mini bottles. I'll be back soon with more fun projects for The Twinery! So stinkin' cute... these are great Dorangela! How fun and clever!!! Great idea!!!! Very fun - love the upcycling! Very cute! The stone twine was a great choice! Great first post Dorangela! And very cute bottles! Adorable! Thank you for using our straw flags in your project! Hi Dorangela! What a cool idea. Totally dig those bottles. These are so cute Dorangela!! What a fun idea! Oh these are just to cute!!! These are *adorable* Dorangela! Great idea!